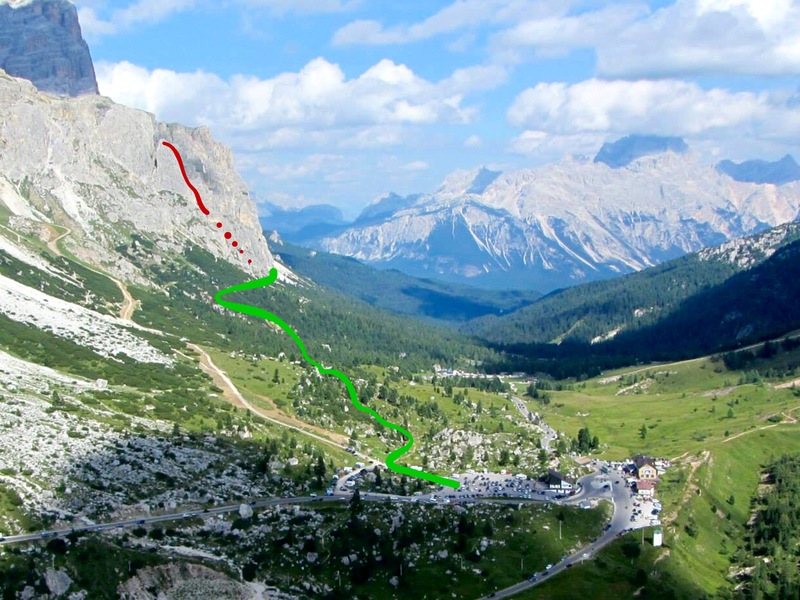 The Comici Route on the Torre Piccolo di Falzarego is a great route with a short 45 minute approach and the grade V- climbing concentrated in the first pitch and which if you like can be bypassed. Otherwise it is mostly IV and is ideal for those looking for the next step up from Sass di Stria. The walk in is easy – leave the car at the Lagozuoi cable car lift station. From the back of the carpark a path winds first through a boulderfield, then through the stunted pines of the tree line towards the ruins of a World War 1 Field hospital, well worth a look. The Falzarego towers are two modest but satisfying looking peaks, the Picolo being a fine pointed summit, separated from the Grande by a deep cleft, some 4-8 metres wide. 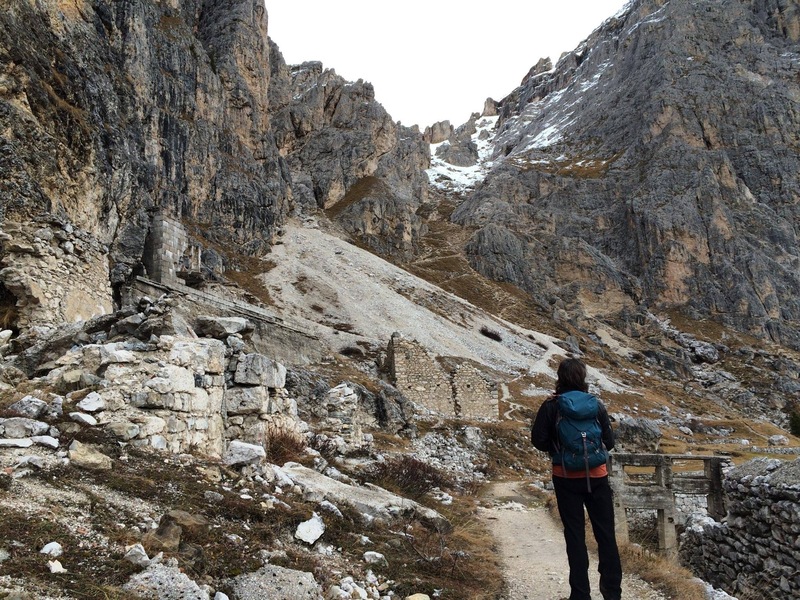 To reach the base of the route, walk steeply up and left behind the hospital to reach more or less the lowest point of the buttress where you will find some earthy ledges to gear up, although it might be easier to do so at the hospital where there is flat ground. Gearwise, you can afford a slim rack; there are so many pegs, that I rarely found myself reaching for nuts. Indeed, we had one small set and Camalots 0.4 – 1 (grey – red) and never felt the need for more. Slings are useful for the numerous threads as the insitue tat although frequent is usually faded and untrustworthy. Standing in the ruins of the field hospital one gets a sense for the isolation and desperation the men must have felt in a sport like this. Comici, one of the great pioneers of the Dolomites lends his name to a vast number of routes on an equally vast number of peaks – it’s rare to find his routes disappointing and he is renowned for his bold, aethetically pleasing lines, not to mention their difficulty with many still presenting a serious challange for the aspiring alpine rock athelete. 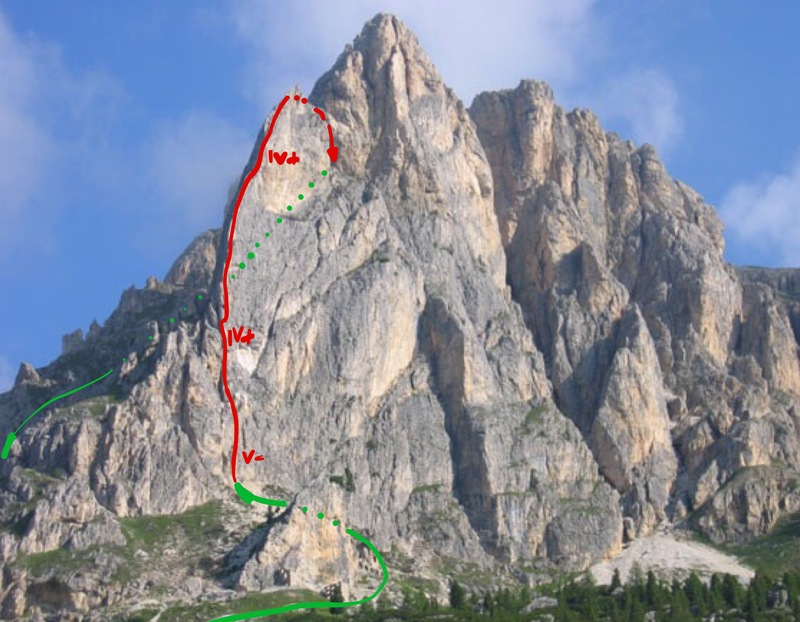 The line on the Falzarego towers does not disappoint, which after a couple of pitches gains the arete of the tower providing great positions. The start seems to have a number of variations at differing grades; we spotted at least 3 different ways to reach the first belay. But as this is a practice area, the route is often marked with red or green way markers, and is very extensively equipped with pitons and cemented in bolts. The third pitch is no less than spectacular, leaving a niche and climbing briefly and steeply up a corner one reaches the top of a flake – step out across air to continue up the arete, which after another 2 pitches leads to the small summit of the tower. Attacking the first grade V- pitch. The difficulties are not sustained and are found in the groove seen here. With excellent rock through out, bar the odd loose flake, this is a great introduction to the area. If there is a chance you might feel the need to retreat, or weather is looking a little less than optimal, the belays are mostly bolted, some with new glue-ins, some with cemented rings. Route finding is mostly very straight forwards with waymarkers helping frequently when you are unsure, as does the fixed protection. I would say that a UK leader comfortable leading a multipitch HS would not struggle unduely with this route. From the top of the third pitch should it be needed, abseiling to the western side of the ridge should see you to an escape route. Felix Idiens climbing high on the arête with Autumn snows on Averau and Nuvolau behind him. 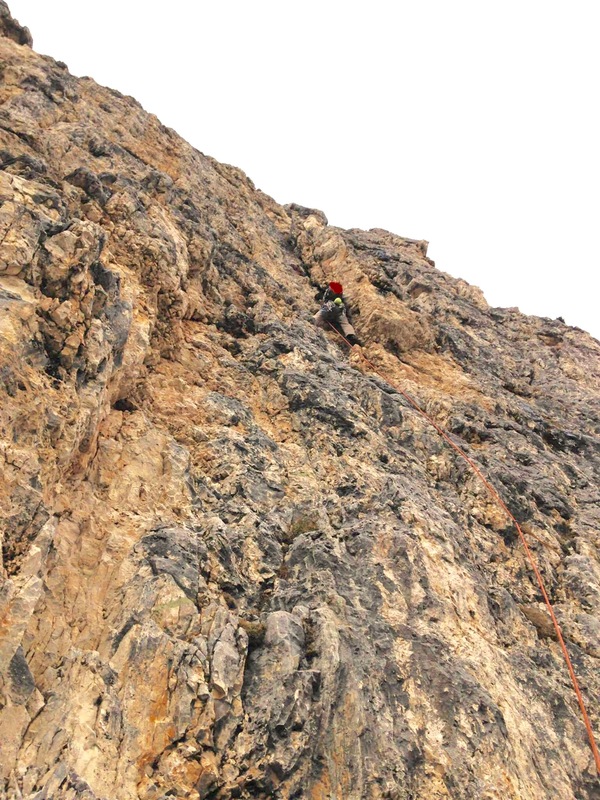 The descent is worth mentioning – once you reach the summit climb quite steeply down the far side of the tower – rings and gear are easy to find so it’s easily protected to a shoulder where you will find three curled steel staples. We used the largest and highest as this was the easiest to access and a 25m abseil landed you at the top of the gully descending between the two towers. This gully is a little tricky in places with two down climbing sections, but could be abseiled with sufficiently long ropes should there still be winter snows in the gully from a ring in the side wall of the gully. Once out of the gully there are two further down climbing sections but they are straight forwards if a little exposed.